Can't find your question? Submit your question here. For all police, fire, medical and other emergencies, please contact 9-1-9. Is air traffic possible on Sint Maarten? The airspace is accessible to military and humanitarian aviation. The airport of Sint Maarten is closed for civil flights. What is the Kingdom of the Netherlands? The Kingdom of the Netherlands consists of 4 countries: the Netherlands, Aruba, Curaçao and Sint Maarten. And 3 special municipalities: Bonaire, Saint Eustatius and Saba. the 3 special municipalities of Bonaire, Saint Eustatius and Saba. 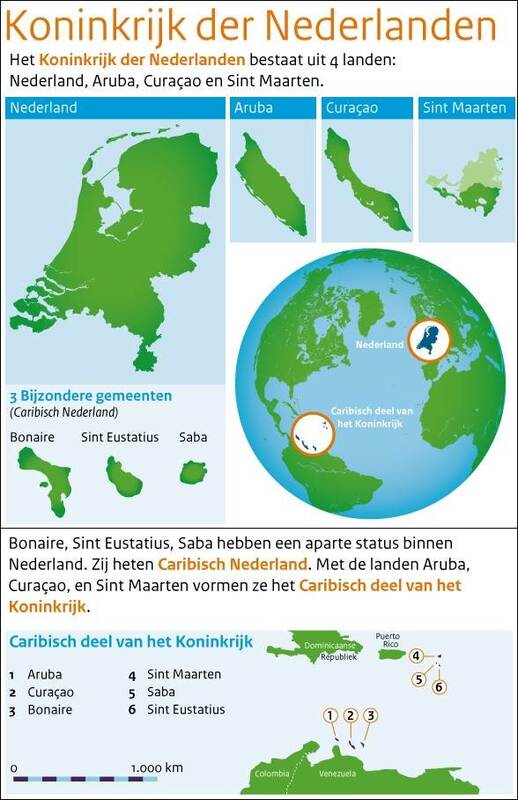 The 3 special municipalities of Bonaire, Sint Eustatius and Saba together are called the Caribbean Netherlands. The Netherlands Antilles no longer exist since 10 October 2010. Aruba, Curacao and Sint Maarten are now independent countries within the Kingdom of the Netherlands. Do the Netherlands and France work together in Sint Maarten? Defense has intensive contact with France. They share information and use each other's knowledge and resources. There is close contact and the lines are short. Both at the operational level and at the political level. Is the Red Cross on location? The National Crisis Center (NCC) in the Netherlands is in close contact with the Red Cross, and from the Red Cross it is also linked to the information provided by the NCC. The Ministry of Defense and the Red Cross work together in the field of transport, logistics and further support. Where can I transfer money to Hurricane Irma victims? Where have the supplies to Sint Maarten come from? In recent weeks, many goods have been offered free of charge by private parties. Some government agencies have sent their own goods (free of charge) (such as police vehicles). A part has been purchased by the Empire (for example, heavy equipment), and Red Cross help items are also included. The naval ship Karel Doorman also takes goods offered by the British government. How can I prevent mosquitoes from spreading? Mosquitoes can carry viruses that make us ill. There is a lot of debris and stagnant water presently creating breeding sites for mosquitoes. It is therefor important to maintain prevention measures. Please keep the area around your house and yard clean. Get rid of stagnant water. Remove tires in your yard or put them under a cover or recycle them. Anything that holds water in and around the yard should be turned upside down, or removed or discarded. Check your water spout, gutters and unclog them. Keep water drums and barrels tightly covered. When will the public bus transportation service start? The public bus transportation system is not fully operational as only few buses are running regularly to most districts. Buses will run from 8:00 A.M. to 3:00 P.M.
Civil Registry (Burgerzaken) will execute the pre-check. Once all the necessary documents are in order, the Cabinet of the Governor will accept the application of the passport. If the birth certificate has already been issued in the past, the Civil Registry can send a copy to municipalities within the Dutch Kingdom. If you have moved to a country other than the Dutch Kingdom you must send an authorized person to the Civil Registry office in St. Maarten, because entities abroad do not accept copies of birth certificates. I'm on vacation on St. Maarten and want to go home. Is that possible? Many humanitarian flights and cruises to variuos countries have already been conducted. for any future flight information. Will I get my money back from a booked trip to St. Maarten? For any refund, please contact the travel organization or the airline. What do the soldiers on Sint Maarten do to help? Soldiers are placed on both Saint Maarten and Saint Eustatius and Saba. Also on Saba and Saint Eustatius, marines help local authorities to free access roads and support for repairs. The military's commitment is aimed at water, food and safety. This also looks at the critical points in the infrastructure. For example, think about the airport and the port. These are both available for military transport. But maintaining public order is also a priority. In particular, opposition to robbery has the military far-reaching powers. And furthermore, there is a lot of patrolling to be visible too. How do the Dutch soldiers and police officers and marechaussees from Aruba and Curacao help to restore order to Sint Maarten? They have the necessary powers such as having weapons and the ability to arrest criminals. They also conduct patrols and have set up checkpoints. Police and the Public Prosecutor (OM) Sint Maarten have announced a zero tolerance policy. The state of emergency announced by Prime Minister Marlin remains in force. e street. I have been evacuated and now come to Schiphol as a non-Dutchman. What should I do? You can contact your travel insurance or you can contact the embassy or consulate of your own country. If I am in the Netherlands, how is care organized? You are responsible for arranging your stay in the Netherlands. For example, with family or friends. Do that before you leave for the Netherlands. Anyone needing extra help can contact the municipality of residence. Because living space in many municipalities is scarce, everyone in the Netherlands must look for this. It is not the duty of the government to take care of this. Where can I, as a municipality, ask questions about support and reception of residents from Sint Maarten? How can I deregister (even if I have already left St. Maarten)? If you plan to leave for more than 4 months, deregistration is necessary. If you have left already, you can send an email to Civil Registry: burgerzakensxm@sintmaartengov.org. You need to send your name, copy of your passport (if possible) and your new address, email address and phone number. They will process the deregistration and send the confirmation to you. Is SZV (Social Health Insurances) currently operational? As of Friday September 22nd SZV's St. Maarten phone lines are open to offer customer service support. SZV customer service is available Monday – Friday from 9:00 am to 2:00 pm via the general number +1721 546 6782. All general inquires can be made by calling this number or contacting us via Facebook. The offices located at the Harbour View Building are closed to the public until further notice. Will the pension benefit payment by SZV take place? Payments of Pension benefits are scheduled to continue as normal. In case of emergency, please call one of the above mentioned general practitioner’s offices/institutions to obtain the number of the doctor(s) on duty. Please do not go to the Emergency Ward at the St. Elisabeth Hospital without having contacted the doctor on duty before you go to the Emergency Ward. How do I make water safe to drink? Make your water safe before drinking. Drinking unsafe water can cause disease, mainly vomiting and diarrhea. It is best to use bottled water for drinking. All other water (from the tap, cistern or wells) should be boiled first, or treated with chlorine for 30 minutes before drinking. If the water looks dirty or smells bad: do not drink it at all! Water from the tap or from cisterns should be brought to a boil and then keep boiling for at least one minute. If you cannot boil the water, disinfect it with chlorine. Use household chlorox, for example, by taking two tea spoons of chlorox for every gallon of water. Mix it and let stand for 30 minutes before drinking. What are Meals Ready-To-Use (MRE)? This week we have started to distribute Meals-Ready-to-Eat, also known as MRE, to the various communities. The meals are essentially rations used by the US Defense Forces. They are high-calorie and specifically designed for food vulnerable situations. The Government of Sint Maarten received this rations from the USAID Disaster Assistance Response Team (DART) as humanitarian relief. When will the water truck pass in my neighborhood? The updates regarding the daily water truck route will be updated on the Government St. Maarten Facebook page. How can I conserve food in a food crisis? Prepare a heavy staple for breakfast that contains lots of protein to take you throughout the day. Try to limit drinking water to 1 to 2 8oz. bottles per person per house hold. Avoid using drinking water for washing dishes. Utilize the water from GEBE trucks for cleaning and hygiene purposes. Throughout the day snack on crackers or other sources of starch and sugar to keep up your energy. Consider creating small back yard gardening of basic fruits and vegetables if the space around your household permits. For example peas, potatoes, tomatoes, lime, and various bush teas. Unfortunately, it is yet unclear when everything will be back to normal. So please consider being as self-sufficient as possible. Where are the emergency shelters?